A bear cub is rescued from a raging river and raised by a couple of two older bears, aunt Lucy and uncle Pastuzo. They name the bear cub, Paddington. Fast forward many years and now Paddington lives in London with the Brown family. He is one of them. His aunt Lucy’s hundredth birthday is fast approaching and Paddington wants to send her a very special gift, one that makes her experience London—the city she always dreamed of visiting. Since Paddington cannot afford to bring her along on a trip, he thinks of the next best thing: to gift her with an antique book of pop up images of London’s landmarks that is very valuable but that an antiquarian friend is going to sell to him for a very special price. Only the book is stolen by...a ghost! Paddington is framed and sent to jail. Now the Brown family must make inquiries to unearth new evidence, or find the perpetrator. What I deeply lament about the onslaught of cinematic sequels these days is that they force me to watch some of the earlier movies before I tackle the latest installment. Paddington 2 was an exception as I didn’t watch the first installment, and perhaps my viewing experience was all the better for it because I had no preconceptions. I loved, loved, loved this movie, as my rating and the ensuing gushing will readily suggest. Paddington 2 is an endearing, bumbling mystery that is hysterically funny (it’ll be most so for adults) but with lots of heart. It has the right balance in the storytelling flow, evidence of a strong screenplay. 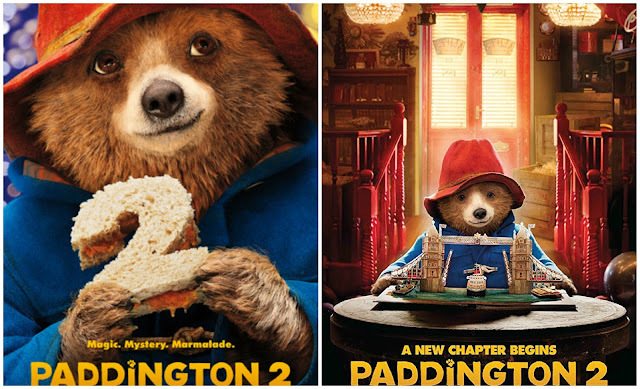 Paddington 2 is a colorful movie that appeals to kids of all ages, with great blend of live-animation and conventional movie making techniques. The cinematography is impeccable, as is the use of lighting and the eclectic musical score. Perhaps one of the most attractive elements of this movie is its star-studded ensemble of British actors interpreting a quirky cast of characters. Hugh Grant makes for a delightful if shameless villain; Paddington the bear is as captivating and endearing a character as is the entire Brown family. Starring Ben Whishaw (Paddington Brown), Hugh Bonneville (Henry Brown), Sally Hawkins (Mary Brown), Hugh Grant (Phoenix Buchanan), Brendan Gleeson (Knuckles McGinty), Jim Broadbent (Mr. Gruber), and Julie Walters (Mrs. Bird Brown). How wonderful and how rare to find pure unadulterated, uncomplicated enjoyment in a film! I'm glad you found this one. I loved this too so think your review is spot on. Thanks, Lynn. Wasn't it lovely? !